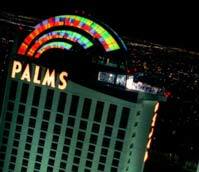 Palms Hotel Las Vegas Pool features 27 Cabanas which let guests cool off in the shade. Each one features all the comforts of home. A 32” LCD, speakers with individual volume control, house phone, lighted fan, refrigerator, safe and luxurious furniture. And for those who don’t want to leave when the Las Vegas Palm’s Hotel party is over, they can stay in one of three two-story, poolside bungalows. Each one features two outdoor decks – one per floor with a hot tub on the ground floor. They have their own private bar, 42” plasma, DVD, stereo and LCD’s in the bathrooms. Upstairs, you’ll find comfortable double bed with direct views of the stage. Palms Hotel Las Vegas unveils $40 million Las Vegas hotel swimming pool renovation this weekend for the 4th of July in Las Vegas.